Tourism Kamloops hired Destination Think! to help facilitate an integrated social campaign for Summer 2015 which was intended to celebrate the niche offerings available to near-in travellers looking for a one- or two night vacation within a half-day drive from their home location. 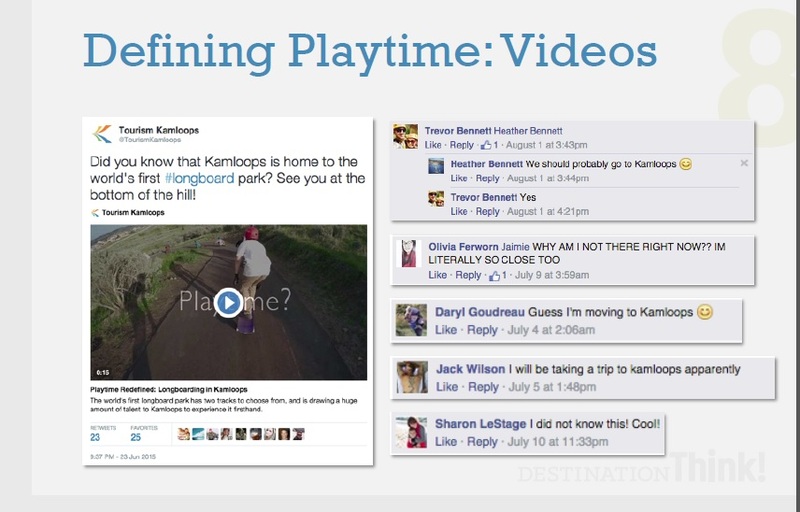 The Defining Playtime campaign combined engaging video, a custom-built microsite, and targeted advertising, to spread Kamloops’ position as the obvious place to relax and enjoy summer in the Okanagan and Thompson-Okanagan. The Defining Playtime campaign was well very received by the local and target audiences. With more than 2 million impressions of content and 365,000 video views, the campaign reached the 18-34 demographic in BC and Alberta at a rate of 4.5 video views every single minute! In total, the videos earned more than two million impressions, with more than 356,000 video views and 29,000 engagements. The average cost per video view was $0.02. *Credit to Destination Think! for campaign report.